Here’s the second preview image from my “Beneath The Surface” exhibition, opening at the Barratt Galleries in 4 days time. This one was shot last November whilst on deployment with disaster relief agency, ShelterBox, in Indonesia. The Mentawai Islands off West Sumatra had been hit by a tsunami, killing hundreds and leaving thousands homeless. Myself and Jodie Hurt (another Shelterbox Response Team member from the UK) had been tasked with organising the logistics of getting the first of 1,000 Shelterboxes to the Mentawais. Boxes had to be flown in from the UK to Jakarta, from Jakarta to Padang and then we had to work out a way to get them to the islands. Our options were very limited and in the end we hired a surf charter boat to take the first boxes and 2 teams of SRT’s on the 12hr sea journey to Sikakap. Unfortunately, bad weather and logistical problems delayed the sailing of our boat and I was unable to accompany the boxes and help with distribution. Still, there is a mantra within Shelterbox about “managing your downtime” and I like relax by wandering off with my camera. The team had stopped at a cheap and cheerful beachside restaurant who’s barbequed squid in spicy coconut milk has to be one the best dishes I’ve ever tasted. The air was thick with the smell of burning charcoal and mouth-watering fish curries as I made my way through the out-rigger fishing boats moored on the beach directly behind the restaurant. We had driven past the lines of colourful working craft many times and I’d being dying to get down there with my camera. Now was my chance. I was immediately drawn to this image because of the metal sheet riveted to the side as a makeshift repair. It reminded me of the stars on the American flag. Then I noticed the stripes. The Stars were in the wrong corner and the Stripes ran horizontally rather than vertically but that didn’t seem to matter. There was a bit of red, white and blue in there, I knew I could rotate and flip the image (is it only me that sees things upside-down and back-to-front) to get the Stars in the top left corner and I thought the semantics of the Stripes were unchanged by their orientation. Besides, there was so much more going on in the image other than the reworked Jasper Johns “Flag”. 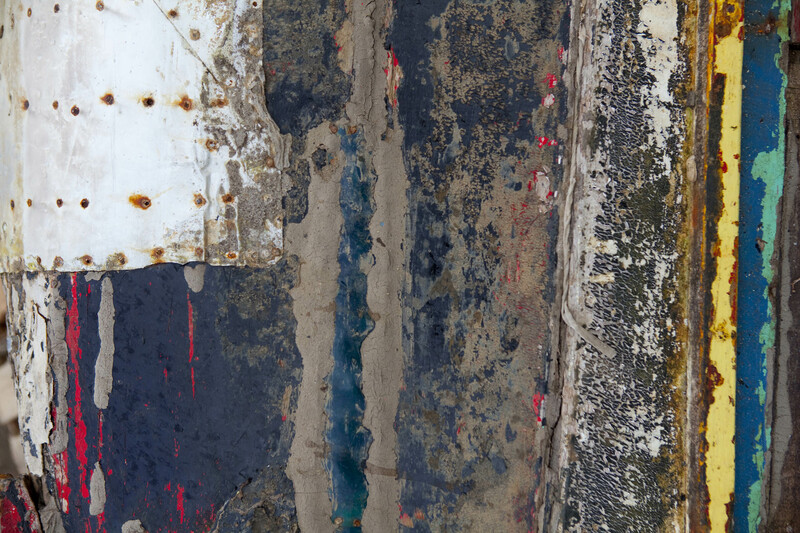 Wood, metal, paint, filler, algae, rust combined to tell the story of a very hard working boat whose owner would try just about anything to keep her afloat. On reflection, was this a comment on Obama, who’d spent some of his childhood in Indonesia, trying to do the same thing with the American economy? This entry was posted in Fine art photography, photography and tagged alstonville, ballina, bangalow, barratt galleries, Beneath the surface, bexhill, byron bay, eltham, federal, fine art, gonellabah, lennox head, lismore, Mike Greenslade, northern rivers, photographer, photographs, photography, Shelterbox. Bookmark the permalink.